Religion, the Senate, an Amazing opinion, spiraling, skeptic strategy, the worst dissertation, humbug, climate answers and more! Are we better off without religion? - Is this a yes/no or an essay question? I hate Joe Lieberman. I mean, I really hate him. - Really, I do. James Randi’s current take on Global Warming - The Amazing One gets this one wrong. Twice. Strategy Ideas for Skeptics - Do we have one? Shouldn’t we? Editor’s Choice: Hovind’s dissertation for download - If you’re a masochist, that is. From the Archives: The myth of the secularist humbug - Even in Britain, the “War on Christmas” was (and is) just a boogieman. Also: don’t piss on Raphael. Within the community of scientists and others concerned about anthropogenic climate change, those whom Inhofe calls skeptics are more commonly termed contrarians, naysayers and denialists. Not everyone who questions climate change science fits that description, of course — some people are genuinely unaware of the facts or honestly disagree about their interpretation. What distinguishes the true naysayers is an unwavering dedication to denying the need for action on the problem, often with weak and long-disproved arguments about supposed weaknesses in the science behind global warming. What follows is only a partial list of the contrarians’ bad arguments and some brief rebuttals of them. There’s not much more I can add in the way of comment to this pick other than it’s timely, given recent and current events with regard to the science of climate change. Given my respect for John Rennie, I offer this pick as a resource and a very good read. Wednesday, December 16th: O’Reily started off chat with his as-usual war on Christmas, and also his recent mention on SVU. Then an argument on whether Christmas is a religious holiday or not. The only argument for the pro-religious side was “the dictionary says so,” and thus the argument ended rather quickly. Dave told an online-shopping horror story, and then talk moved on to shopping for nonreligious holiday cards. Getting back to politics we wandered into the health care crisis with Lieberman and then climate “skeptics.” After trying to come up with a better name for people who think global warming isn’t happening (or isn’t man made), and discussing where exactly Randi’s view lies, chat moved on to Law and Order and possible legal loopholes. Chat ended with this rather hilarious site. 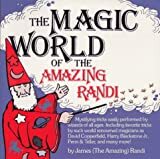 The Magic World of the Amazing Randi, by James Randi. There were 23,411 daily visitors this week. There were 90,685 daily visitors in November, 2009.